Two weeks ago we endured the third anniversary of the death of my beloved pastor and father-in-law, David Fitzpatrick. David was killed by an impaired (alcohol and drugs), hit-and-run motorist. Davids killer pleaded guilty to first degree vehicular homicide, among other charges, and is now spending many years in prison. I recall vividly the gut-wrenching moments on May 4, 2015 when we knew there was a bicyclist down in the area where my father-in-law used to ride. The calls to Davids cell phone that would never be answered; the rushed and lonely drive from my job to the crash site, still not knowing for sure whether David was alive; the moment I encountered the Georgia State Patrol officer who confirmed our worst fears; pulling into my mother-in-laws driveway and watching her, my wife, and my wifes sister awash in grief; attempting to comfort our four children; making the phone calls to Davids and Margies siblings, my parents, et al, telling them of the terrible newslike so many others who deal with such a loss, all of this sent me to an awful place I had never before been and never want to return. Whats more, the investigation into Davids death led us to discover that his killer had a decades-long criminal past (including multiple drug-related crimes) that was ignoreddue to a lack of proper inquiryby our local law enforcement when he was on trial for other charges in 2010. What to do? Kevlar backpacks for all children, and issue each child a .22 revolver pistol and train them how and when to use it. The first is defensive, the second is the right to keep and bear arms for offense. Also, close down every school that does not teach our children to read at the end of first grade, and disqualify the teachers from teaching ever again. And disband the NEA. That’s for starters. Truism: “Olde Billy was right!”. Im gonna rename my AR-15 and call it an MS-13. Then the democrats will protect it! Back in the 60s I got a job at the local state mental hospital nights while going to school days. The liberals had 90% of these hospitals closed and released dangerous inmates out into society. You can start by reopening these hospitals and committing dangerous sick minds. Truism: Olde Billy was right!. I meant to also send to you. Why, defend the STUDENTS, silly. First, put up a well-built high fence around each school with guards at one entrance designed to let people in and out quickly with a metal detector. Then, when school starts, that (or those) guard(s) will be in the building armed and patrolling. Next, allow teachers who volunteer go for training and do concealed carry. Then enact laws that dictate that anyone who tries with or without success to perpetrate a school shooting or any harmful act that would injure or kill people at the school will be tried, and if found guilty, will be executed within six weeks of the incident occurring. Last of all, we need national, state and local leadership that encourages people to return to a value system of right and wrong. 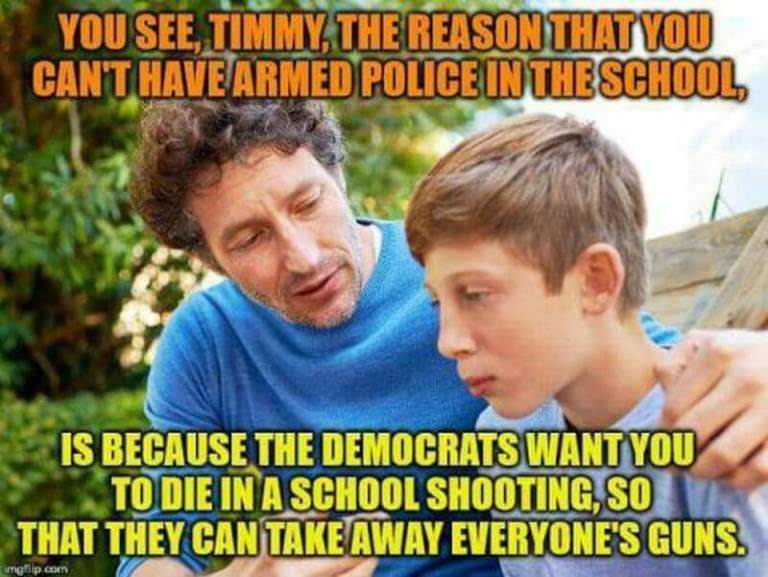 If that doesn't happen, no wall will be tall enough and not enough adults will be armed to stop the violence we are going to see. Speedy trial within one year, execute the murderer on live pay-per-view television, and give the proceeds to the victims families. While were at it, lets add MS13 members and have a reality TV show. Kevlar for the kids, pistols for the faculty. Perfect! I laughed so hard I snorted! Well, as victims (stooges?) of the govt. school system, the libs are hoping the vast majority will vote democrat.